It is time for a winner to be chosen. Who will be the lucky runner that gets to punish themselves for 26.2 miles of Atlanta roads for free? The Publix Georgia Marathon will be here before you know it and the streets will be lined with runners from near and far ready to take on the downtown course and see if they have what it takes to finish victorious. If you have not yet signed up and you are not today's winner you can still sign up at the Publix Georgia Marathon Registration Page with $10 off of either the full or half marathon by using the code: BLOG10OFF13. We had 57 total entries in the comments. I entered these into random.org and the winner was selected. 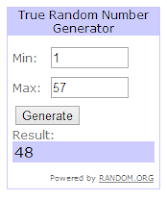 The random number selected was 48 which is Nat from The Negative Split. Nat, please email me at info@262quest.com to claim your free entry! yayyyyy!!!!!!!!!!!!!!!!!!!!!! Yippy hot skippy! :))))I had a crazy busy day and managed to squeeze in a short tempo today after work, after kid conference and before other kid's orchestra concert and was thinking during said tempo how happy I was that my body can forgive and forget the rigors I put it through last weekend to let me have--and enjoy-- a much needed run.But this, this is frosting and carmel sauce on the icing! Many thanks!